I love my 2001 Nissan pathfinder. I am the second owner, I've had it for 6 years and have had no problems with it. I live in North Dakota and the winters here are very cold but it always starts right up the first try I can definitely rely on it. It fits me perfect as far as comfort but my husband is a big guy and he says it has to many blind spots for him so he only drives it if he has too. When it comes to features it has pretty much other vehicles this year has. My 2001 Nissan Pathfinder is extremely reliable decent miles to the gallon plenty room for family, one of favorite features would be the Bose system and GPS four by four so you can make it anywhere in any weather. It's perfect for those who live in the mountains and for those who live in the city common vehicle so if I need to go to the shop it is usually cheap to fix. 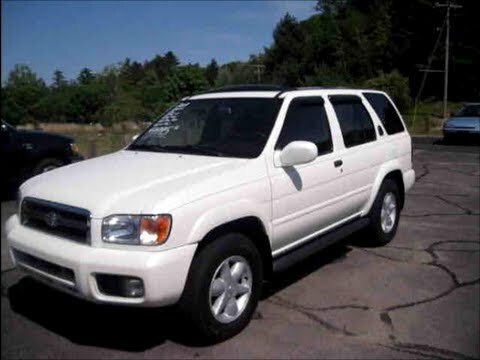 Reliable, roomy and comfortable 2001 Nissan Pathfinder. My vehicle's only problems are a result of it being a 2001 so it is general wear and tear due to age. I love that it is a Nissan because in my experience Nissans are very reliable and outlast the typical mileage of many other makes. The cloth seats are very comfortable and the backseat and trunk space is very roomy. I have very good gas mileage as well. On certain sport utility vehicles, some of the brackets used to attach the two gas struts to the rear door (hatch) may have been improperly made. At high ambient temperatures, the increase in gas pressure in the struts could cause one or both brackets to bend, resulting in the struts detaching from the brackets when opening or closing the rear door. If both struts detach from the brackets, the door will rapidly fall down, possibly striking someone and causing serious injury. Dealers will replace the strut brackets. The manufacturer has reported that owner notification would begin during September 2001. Owners who do not receive the free remedy within a reasonable time should contact Nissan at 1-800-647-7261. Nissan is recalling certain model year 2001-2003 Maxima, Pathfinder, and Infiniti I35; model year 2002-2003 Infiniti QX4; and model year 2003 Infiniti FX35 and FX45 and possibly certain Sentra vehicles to address a safety defect in the passenger side frontal air bag which may produce excessive internal pressure causing the inflator to rupture upon deployment of the air bag. This recall addresses both the passenger side frontal air bags that were originally installed in the vehicles, as well as replacement air bags that may have been installed as replacement service parts. A replacement air bag may have been installed, as one example, if a vehicle had been in a crash necessitating the replacement of the passenger side frontal air bag. Owners of all vehicles on which a defective air bag may have been installed either as original equipment, or as a replacement, will be notified. Dealers will inspect vehicles, and where a defective air bag inflator is identified, the inflator will be replaced, free of charge. The recall is expected to begin during July 2013. Owners may contact Nissan Customer Service at 1-800-647-7261.